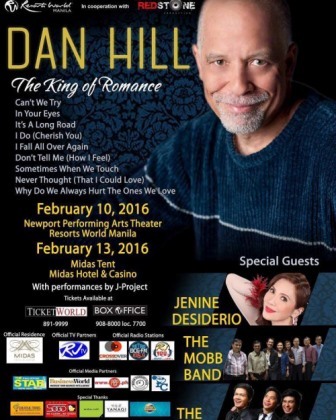 Relive the Love Songs of Dan Hill Live in Manila This Valentines Day! Dubbed as The King of Romance, Dan Hill will serenade you live in Manila via two pre-Valentines concerts this February 2016 in two different venues. Yes, you heard it right, two concerts from the king of romance! Brought by Redstone entertainment and TAG Media, Dan Hill will have two love concerts in the Philippines - first in Newport Performing Arts Theater Resort World Manila on February 10, 2016 and second in Midas Hotel and Casino on February 13, 2016. Dan Hill popularized the hit love songs like "Can't We Try," "In Your Eyes," "It's a Long Road," "I Do (Cherish You)," "I Fall All Over Again," "Sometimes When we Touch," and "Why Do We Always Hurt The Ones We Love." Special guests on the concerts are The Mobb Band, The Angelos, and Jenine Desiderio. Tickets are available at Ticket World and Resorts World Manila Box Office Booth.